Though the Gesu parish is celebrating this year the fiftieth year since the opening of its great church, nevertheless the “old timers” will still continue to remember that the parish existed before that when it was called the Holy Family. To them the present Gesu is the “new church”, and the first church which was on the corner of Seventeenth and Stiles, will still seem dear to them. How many know, in fact, that the parish is really seventy years old, not fifty? It was in March of 1868, that Fr Burchard Villiger SJ came to Stiles Street and took up his residence in the south block between Seventeenth and Sixteenth streets. Fr Felix Barbelin SJ had bought the square between Eighteenth and Seventeenth, Stiles and Thompson, in 1866 for $45000.00. The idea was to build a college there which would some day blossom into the Catholic University of Philadelphia. The Jesuits had sent one of their most distinguished men to Philadelphia for that purpose. Fr. Villiger had been director of studies at the old St. Joseph’s College when it was first founded at Willing’s Alley in 1851. He had been Rector of two other Jesuit houses in the East; he had been Provincial of the Maryland Province for three years; he had been Superior of the Mission in California during the Civil War, and was also the second founder of Santa Clara College. When the Philadelphia plans began to grow in people’s minds, they began to think of Fr Burchard Villiger, as one who was a financial and organizing genius. He came in March, 1868[i], and in short time he had his plans made. He felt that there would be little support for a college unless there was a church and a congregation. So he built a chapel 60 by 104 feet on the southeast corner of the square, and west of that he put up a two-story residence for the Fathers on Stiles Street. It took him only five months to finish it, and on December 6, 1868, the Church of the Holy Family was dedicated. The neighborhood was growing rapidly, and in three years there were 2000 people in the congregation. In accordance with Jesuit tradition, the Sodality of the Blessed Virgin and the Bona Mors Society were founded in 1869, and so the religious growth of the parish was assured from the start. That same year the Conference of St. Vincent de Paul was begun, for the spiritual advancement of the men who joined it in order to perform the corporal and spiritual works of mercy. The Sanctuary Society was also begun about that time. Its purpose was to support the altar by small contributions each week from the members. Father Villiger had been sent by his superiors to found a college. Yet for twenty years he was a parish pastor, and devoted his time to the works of the parish, preaching, hearing confessions, making sick calls, and after 1873, also managing the parish school. In that year he bought from the Quakers the lot on which the school stands for $14000.00, and immediately built the basement for $21000.00. These two sums he had all paid off by the following year. He finished the school building in 1879, and thus he could feel that he really laid the foundations of a strong and abiding parish. During all this time, he had never lost sight of the aim, which was to give Philadelphia a Catholic College worthy of it. It is interesting to remember that Father Villiger always called the parish school the “Preparatory Department of St. Joseph’s College.” To him, the Holy Family Church was merely the college chapel, and hence when it was opened it was merely blessed, not dedicated or consecrated. When the great church was to be built, he had planned the older church, or chapel, in such a way that it could be turned into a college building at little cost. I have said that Father Villiger had the reputation of being a financial genius. There are many, however, who think that this genius consisted mostly of two very ordinary things: a wonderful facility of winning generous friends, the Drexels and Bouviers, for instance, for whatever he needed. But at the same time, he began the old church, the parish school, and then the new church with only the barest hope of ever getting enough money to pay for them. That hope was never betrayed, however. Somehow or other, he managed; and he always knew that God would come to his rescue if he gambled too much on a holy project[ii]. Hence the very year that he finished the parish school he at last began the work on his great dream, for which he had schemed, begged and argued since he had come to Philadelphia. Ground was broken on March 10, 1879, and then bystanders were amazed by the tremendous masonry foundations that began to be laid. They were twelve to fourteen feet thick. He had from the beginning in his mind the enormous masonry arch that was to span the nave of his church. It was to be a church like the Gesu in Rome, and like that great temple it was to be lined with precious colored marbles. Father Villiger never found the money to buy those marbles, and so he left the inside of white plaster – not very beautiful and easily darkened by smoke and dust. His reason was characteristic. If he decorated the church he knew he would never get the marbles; if he left plaster in place undecorated, he thought people would at last grow tired of it and buy the marbles of which he dreamed. His guess was never fulfilled, for in later years the church was tinted by Brother Schroen, SJ, and thus I suppose the dream of emulating the Gesu in Rome was abandoned forever. The church took ten years to build, for the money did not come in as fast as Father Villiger had hoped, and besides, the making of that great arch across the church was a tremendous undertaking. Meanwhile, however, he was looking forward to the future. He bought some very precious paintings by the great Mexican painter Cabrera, now ranked among the great masters of the world. He had also in mind two great towers over the entrance of the church, and in these were to hang the best bells he could have made. The towers were never finished to this day as he would have liked them, but he bought five bells, or rather, had them made in St Louis, in 1886, ranging from 700 pounds to four tons, and he hung them in the towers in 1887. Some men of the parish were trained to ring them under the guidance of a lay brother, and many were the comical tales told later when the bell ringers forgot to let go of the ropes after they pulled them, and shot twenty feet upward toward the roof. They were not rung at once, however, for the church was not finished[iii]. During these later years, however, the work went on more rapidly, for in 1885 Joseph Anthony Drexel, a devout Catholic, left $72000.00 to Father Villiger, and though this did not pay all his bills, it did help and he began to see the fruition of his two dreams: the completion of the Gesu and thus the freeing of the building at seventeenth Street for the college. The two events were to coincide. He had already brought St Joseph’s College up from “The Alley” and installed it in the basement of the school, in readiness for the opening of classes in 1888. The dream of twenty years at last dawned. By superhuman efforts on the part of Father Villiger and his clergy, and also the people of the parish, the great church was about to be finished. In his diary, Father Villiger tells of the “fairs, lectures, concerts and excursions” which he had offered in a constant stream to make possible the building of the church and the college. It must be remembered too, that Father Villiger’s ideal was that the tuition at the college was to be free forever: the Fathers were to give their services gratis, and they were in turn to be supported by the parish itself. It was no doubt a beautiful ideal, but it proved impractical, and tuition was charged in the college soon after Father Villiger retired in 1892. The modern expenses of a college are more than the most generous parish could supply. Besides, in spite of all the gifts that Father Villiger could gather to himself in his winning way with people, there still remained a large debt on the church after it was opened, and it has not been paid off to this day[iv], fifty years after, and so the church has never been consecrated. But back in December 1888, all was enthusiasm in the Gesu parish. It is true that the congregation had already had a glimpse of the interior of their church, for in October, it had been opened for one great day to celebrate the golden anniversary of the entrance of their pastor into the Society of Jesus in 1838. For that reason, incidentally, this year of jubilee has significance, for it marks the 100th year of Father Villiger’s religious life. In 1888 the sixty-nine-year-old Swiss pastor was full of vigor and good humor. The years had changed him from the potential college president into a zealous old parish priest, and few parish priests have been loved with the complete devotion that he won for himself. We who knew him as little boys, or who took part on the altar at his funeral in his own church in 1902, can testify only from hearsay. But the people of the Gesu parish looked on Father Villiger as a saint, and many a family still preserves the memory of what they considered to be miracles worked by him with St. Ignatius water[v]. Archbishop Ryan dedicated the church on December 2, 1888 in the presence of a large concourse of people. From that day the church at the other end of the block was abandoned and the new church was the proud boast of the parish. 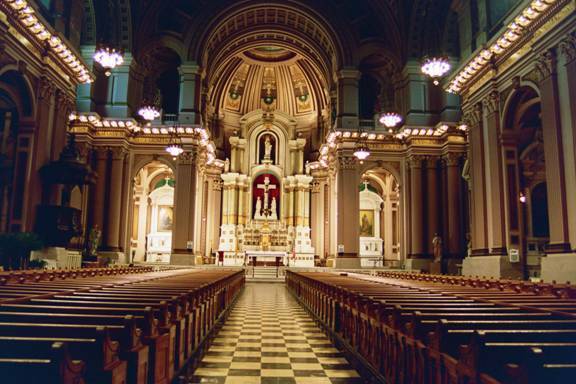 It had an enormous sanctuary, for Father Villiger thought of liturgical functions in large terms, and he wanted great numbers of altar boys to go through their evolutions during High Mass. Where else would you have not one but four censers on Christmas and Easter, and everything else in proportion? In a few years Brother Anthony Beckmann, SJ, was given charge of the altar and also of the altar boys. He was a hard taskmaster, and we were all afraid of him. He was Prussian in his ideas of discipline, and his temper was not always smooth. But he never let any boy serve Mass unless he knew the Latin perfectly (and he meant perfectly) and there was never any ceremony on the altar that was not rehearsed over and over again until it also was perfect – and we were nearly dead from fatigue. I think that the tradition that Brother Beckmann established for the Gesu in this respect has never been abandoned. Another early effort did not have the success which attended the St. John Berchman’s Society (otherwise known as the altar boys). This was a boy’s choir. In later years a great organ[vi] supplanted the one with which the church began, and which I believe had been in the old Holy Family Church. For years there was a mixed choir of men’s and women’s voices. I believe it was a good one; and of course the organist, Frank O’Brien, was a first class musician. In the 1890’s Father Buckley, SJ was given the task of pioneering for a boys’ choir. He began by rehearsing for Holy Week Services, and apart from the disturbances caused by his taking from Brother Beckmann some of his altar boys to sing in the choir, the debut was a success. Later, Father P. F. O’Gorman, SJ, and Father (then Mr.) J. C. Davey, SJ, had a choir for Holy Week, but it was well on into the new century before the Gesu really had a regular boy’s choir under Frank O’Brien for Sunday High Mass and Vespers. When St. Joseph’s College moved from the basement of the school into the quarters vacated by Holy Family Church, the basement was made over into what was called the “young men’s rooms.” It was a club, with billiard and pool tables, for the men of the parish, and its particular patron was Father Theobald McNamara, SJ. A club similar to it in New York, the Xavier Union, had grown in to an important fixture in metropolitan life there and was later known as the Catholic Club. No doubt, the Gesu experiment was intended to emulate it; but its untimely end trails off into the dim years. The real Catholic life of the parish from the beginning was in the various sodalities. Not that there were several at first. For some years there was only one sodality for everybody, but about 1895 this was divided up into four branches and they met on different days of the week. They were all vigorous activities, and along with the League of the Sacred Heart they gave a corporate life to the parish that was an unfailing source of interest and zeal among the parishioners and of grace from heaven. Father Villager would have rejoiced to see the completion of all his plans around the block, when the college buildings were finished, first on Seventeenth Street under Father William J. Clark, SJ, and then on Thompson Street under Father Albert Brown SJ, and then a new residence built for the Fathers back of the church by Father Charles Lyons, SJ. This to him would have been the fulfillment of all that he had dreamed of during the twenty years he was working against great odds and in poverty to build up both the college and the parish. Probably never before had anyone looked on a city college as a ward of a single parish, and it was not surprising that his ideal of a free college supported by a parish was not carried out. Far beyond his dreams would have been the building of the institution out on City Line and the wonderful growth of that institution. But he would have accepted it all, as he accepted everything, and taught his parishioners to accept, as a gift from God who is not to be outdone in generosity. The Gesu parish has during all its years carried out that thought. It has been a generous parish because it has been a religious parish. For this reason its influence has been wider than the parish limits. It has always attracted people from all over the city. Perhaps this is what Father Villiger had in mind when he sought a church for his college; for certainly he expected that his college would be a city college. Many of the sons of the parish have entered the Jesuit Order, and have brought its traditions into many cities and countries, even as far as the Philippines. Many of its daughters have done the same in the religious life. As a source of leadership and of spiritual enlightenment, of generous self-sacrifice and religious teaching, the Gesu parish has always, we may believe, had a big place in the designs of God for the city and the country, and please God it will always have that place. [i] It is interesting to keep Father Villiger’s wanderings in historical perspective. The First Transcontinental Railroad was begun in 1860 and finished in 1869. Travelers to and from the west coast back then would take the train to the end-of-track, and thence by stagecoach to the other end-of-track and thence on to San Francisco. Santa Clara College is near San Diego. He must have taken this trip at least twice. The alternate would have been a nasty sea voyage around the Horn or a sea voyage to Panama, and a journey across the Isthmus with all its disease issues etc. He was lucky to live through all this. [ii] During the time that the Gesu complex was being built the Civil war and the reconstruction following thereon was in process. Philadelphia was far enough north that it was relatively safe from raids by the Confederates. And so the Philadelphia economy was booming supplying war material to the Union Army. Also, wave after wave of immigrants were coming to America including the Irish driven from home by the potato famine. The biggest employer in the parish was the Baldwin Locomotive Works, which was doing a booming business in war work. This was long before it moved to Chester, PA. Translated into modern sums, building the Gesu cost $25 million and the rest of the complex an equivalent amount. Although by any estimate this was a massive undertaking, the money was available out in the community and it was a question of cajoling the parishioners and the available wealthy patrons into parting with their funds to see the project through. In other words, it was doable. [iii] This sounds to me like a “peal of bells”. This was not rung like a carillon would have been, but rung in a pattern in the English tradition. The only other “peal of bells” I am aware of in Philadelphia is at St Marks Episcopal in center city. [iv] Remember this was written in 1938. I am sure by now the debt has been paid off. [v] I can find no reference to this anywhere. I suspect this was a local tradition. [vi] This organ was built by W. W. Kimball of Chicago in 1905 and it was a gift of Bernard Coll. It was destroyed in the 1950’s because it required releathering and it had not been maintained. In an excess of modernism an electronic substitute (early Allen organ which is now dead) was found, and the decision was made to dismantle the Kimball. A much better plan would have been to preserve the Kimball untouched and unplayable until funds would have become available to affect a repair. The Allen could have been put elsewhere in the church for interim use.